Actually, it probably doesn't make much sense to use the word "top" here since it was pretty much the only seven that I saw the whole weekend. I had totally intended to do another top ten Nintendo-related cosplay list like I did for ACen last year, but as it turns out PAX attendees are not really about the cosplay as much. While probably around 50% of the ACen attendees were in cosplay, at PAX East it was closer to 1%, if that. Still, I managed to get a few good ones. A pretty standard Link. Nothing overly impressive, but still cool. Fire Emblem actually seems to get a lot of attention from cosplayers, with Ike being one of the main ones that I see. This guy did a decent job. Godot also seems to get a lot of cosplayer attention for one reason or another. I guess it is the wicked half-mask. Both Pit and Dark Pit from Kid Icarus: Uprising? Sounds like a pretty good cosplay combo to me! Although it is pretty common to see big groups of cosplayers at ACen, this was one of the few groups that I saw at PAX East. Skull Kid aka one of the coolest Zelda characters ever. I noticed that Zelda cosplay was in this year. If you got it, you might as well flaunt it, amirite? And this guy has it. Companion Cube with a mustache and top hat for some reason. A pair of Journey characters. That was such a neat game. And... the same Journey characters, battling it out against each other. Unfortunately that was about it for video game characters that I saw and recognized. There were some others, but I think they were related to MMO PC games and such, stuff I don't really follow. Ah well. I'll try to do better at ACen again this year! That King Hippo is classic. Take that dude on the road, Nintendo! It never dawned on me before that the Journey characters don't have arms. I like the A Link Between Worlds representation here. Hilda looks pretty cool, though I'm kinda bummed she doesn't have her scepter. Oh yeah that totally is her! Somehow I missed that. I like King Hippo Guy, too! Zero chose well to make him #1. *scoff* Mustaches: the ultimate everything. Best cosplay is Space Marine cosplay. Great some Aussie shows up and ruins my awesome thread with boring cosplay. Might as well throw in some Halo cosplay while we are at it. 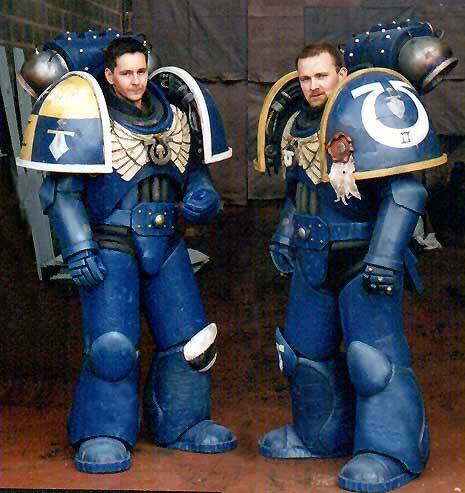 Those Space Marine costumes always crack me up. I mean, there's ALL THAT ARMOR FOR ULTIMATE PROTECTION...but then no helmet to guard the most important and vulnerable part of the human body. Who in the world designed those?!? It's weird. The rank and file marines get helmets. But the sergeants and captains and so forth all run around without helmets. I suppose it's so you can identify the individual characters for gameplay purposes. And I guess if you want to get pedantic, most marines in the higher ranks have person force fields or some such so helmets aren't as important. If there are force fields, why is there armor? What's a "college fund" and where do I apply to get one?! I dig it. 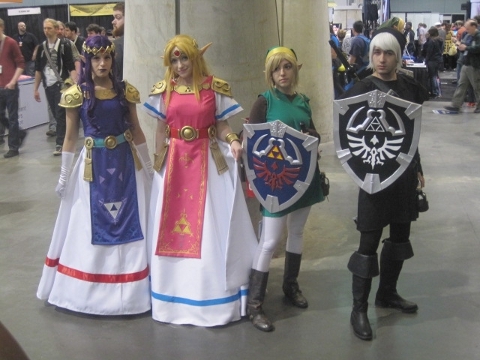 It's cool seeing new Nintendo characters people can cosplay, and then seeing it done right.